Samantha Standring in Drama on 2 May, 2011. Walking around Durham in spring, it’s easy to see the Cathedral as simply a peaceful and picturesque feature: a stunning monument against a clear blue sky. But the Cathedral has had a troubled and fascinating history. 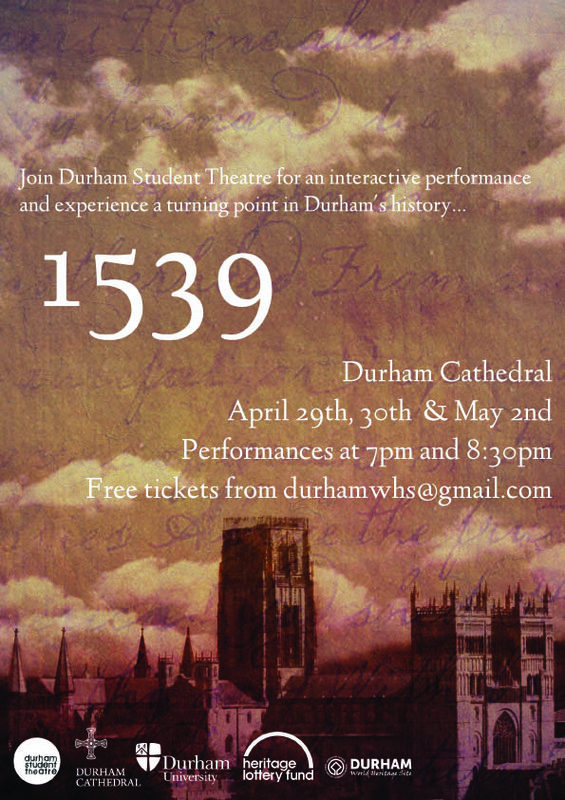 Following the success of last year’s World Heritage Performance, “1072”, Durham Student Theatre is again offering students and the public the chance to explore a crucial point in the history of Durham. This year, their performance at Durham Cathedral is set in 1539 against the backdrop of Henry VIII’s infamous Reformation. Part play, part tour, this performance offers an interesting way to discover more about one of Britain’s first World Heritage Sites. Housing a Benedictine monastic community early on, the Cathedral became the resting place of Saint Cuthbert after his followers endured many years without a fixed basis. Removed from Lindisfarne and Chester-le-Street due to the instability caused by successive Viking invasions, Cuthbert allegedly came here after a monk had a vision that he wanted to be buried at Dunholm. The original monastic foundation to house the shrine of Cuthbert was the “White Church”. It is on the same ground on which the current Cathedral was built. Designed in 1093 by Prince Bishop William de Calais, Durham Cathedral is the only one in England to retain almost all of its Norman craftsmanship. DST’s performance, co-produced and directed by Paul Moss and Kate Hunter, focuses on the arrival of three commissioners sent to Durham by the Crown to strip the Cathedral of its assets under the pretence of clerical abuses. Such destruction affected ecclesiastical buildings all over the country and, as such, the Dissolution of the Monasteries has remained a black mark on Henry VIII’s reign ever since. The play culminates in the tale of the miracle of St Cuthbert, in which his coffin was cracked open to allegedly reveal a totally preserved body. The audience have the opportunity to see parts of the Cathedral usually closed to visitors, including the Library and the stunning Chapter House, where the monks would meet twice a day to read from the Rule of St Benedict. The Chapter House is the perfect setting for an interactive performance. The simple effect of strategically placing three actors amongst the crowd gives the feeling of being drawn back in time, experiencing the daily life of the monks and their initial troubled reaction to the discovery of the commissioners’ impending visit. Asking a member of the audience, assumed to be one of the monks, if he was guilty of the sin of drunkenness the previous night helps to consolidate this effect as well as adding to the comedy featuring throughout. The puppet show and silhouette projection are novel and comic ways to target audience members of all ages and, given the short duration of the performance and thus its inevitably reductive nature, it is ideal for conveying the historical background of the Reformation succinctly. “I find history very difficult,” said Karina Darjuan, who steps into the role of a tour guide, and remarked that innovative methods of conveying the information were more likely to help people remember the historical facts, whilst still allowing them to enjoy the experience. “History can be perceived as a boring thing” commented Seif EL Rashidi, a representative of the World Heritage Site. People are too predisposed to walk past fascinating places and never notice or think about them, he added. The combination of performance and tour successfully makes their retelling of the events of 1539 not only memorable but entertaining. Beth Greenwood perfectly captures the helplessness of the monks against a monarch with the power and motive to destroy all that they believed in. Likewise, Karim Mariey’s dramatic portrayal of Hugh Whitehead, who eventually became the first Dean, effectively represents the spirit of the situation as the monks discuss hiding Cuthbert’s treasures. Although the Saturday performance was slightly marred by acoustic and technical difficulties, “1539” is enjoyable and informative. Having the chance to watch a walking performance in the beautiful real site of the performance’s events is totally different to other Durham productions and worth experiencing. The script, written jointly by all participants and largely based on Geoffrey Moorhouse’s The Last Office, was given life by the enthusiasm of the performers, who were all eager to learn more about Durham and keen to stress the benefits of taking time during university studies in such a culturally rich city to get involved in the local history. The shrine of St Cuthbert, finally laid to rest in 1542, can still be visited today.